​ 50 Spelling Bee contestants set for finals - BlogIT with OLIVIA!!! 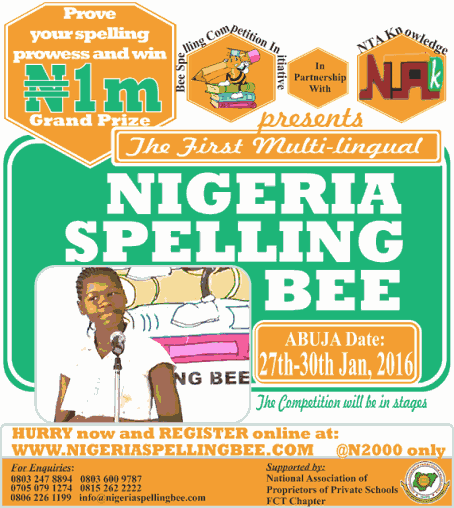 No fewer than 50 students from nine participating states have been qualified to represent their schools at the Grand Finale of the Spelling Bee Nigeria scheduled for April 22 , 2016 at The NECA Hall, Plot A2, Akin Balogun Street, CBD Alausa, Ikeja, Lagos. The eight participating states whose students scaled through state level include; Lagos, Rivers, Akwa Ibom, Kwara, Oyo, Osun, Ogun, Nasarrawa and the FCT, Abuja. 1st Prize winner gets an all-expense paid trip to the 89th Scripps National Spelling Bee in Washington DC, USA as a guest, plus a scholarship Fund, whilst the 2nd Prize is an all-expense paid trip to Pearson Publishing House, Harlow UK and a scholarship fund. Pearson Education was recently unveiled as the official dictionary of the Spelling Bee Nigeria. 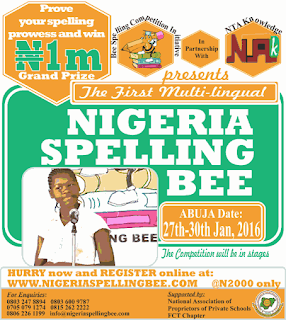 According to Akin Olu-Philips “The Spelling Bee Nigeria is targeted at students between ages 8 – 13. The year’s edition began with the training the trainers’ sessions at 2 venues: Abuja and Lagos, where Scripps Certified Linguistic professionals took teachers through an intensive 3-day training. “They will arrive Lagos for the 3-day camp with their Chaperones on April 20, 2016.